Many toddlers today will interact with a digital device before they utter their first complete sentence. Scary, right? But letting a one-year-old play "Peek-a-Zoo" or watch the Baby Shark dance on your iPad en route to grandma's house is very different than baby's first cell phone. For most Americans, that milestone comes at around age 10, according to research by Influence Central. And we're not talking about basic phones - these are full-fledged smartphones, capable of accessing the internet, downloading apps and messaging. By the time they get their first cell phone, digital natives have probably had enough screen time to use it as effectively as - and, in some cases, more proficient than - their parents. But children roaming freely without supervision in the digital realm is concerning. We want to protect them from explicit content, cyber-bullying and other web risks without sheltering them from mobile phones and other technology. Achieving the right balance takes a combination of common sense, awareness, open conversation and resourcefulness - as well as knowing what the right phones for kids are. Keep those tips for keeping kids safe and happy when dealing with smart devices in mind. It's easy to feel pressured by children to get the latest and greatest toy, especially when that toy is a smartphone. But your children aren't at risk of becoming Luddites if they don't get a phone by age 10, no matter what they may think. Kids have access to computers and other digital technologies at school for educational purposes, often with key firewalls and content filters already in place. For those looking to ease their child into the digital world, consider a tablet, pre-loaded with parental control software. If your main concern is having a way to communicate with a young child, a basic flip-phone with calling and texting is perfectly reasonable. It's easy to feel like the bad guy, particularly if your kids' friends already have smartphones. But your child's development, well-being, and safety are priorities above all else. Just remember: Even Bill Gates, who amassed a fortune on digital technology, said he didn't let his kids have cell phones until they were 14. Our opinion? Wait until eighth grade at the earliest. ● Set parameters for when devices are off limits - the Washington Post recommends creating "screen-free" zones in the house). ● Make conditional rules, like no tablet or smartphone time until all homework is complete. ● Decide how much screen time is too much and get children involved in activities that can keep them occupied and offline. Parents should also caution kids and teens against potentially risky behavior on the web. If they're using social media, encourage them to set their accounts to private and to avoid messaging with anyone other than friends and family. It’s important to level with kids: Explain why privacy is important, and tell them that not everyone is who they claim to be online. A lot of this information will likely be reinforced during tech-safety seminars at school, but it's a conversation worth having with your children regardless of age. ● Clearly communicate to kids that they should inform you if they feel bullied or harassed online. ● Warn teens about the permanence of anything they post, send or share. ● Set an example by not spending too much time in front of your own device. ● Remind teens that smartphone usage is a privilege that you pay for and that they need to earn. This is one of the cheapest options for basic messaging and GPS with a very child-friendly interface. Yes, it’s a watch instead of a phone, but for younger kids, that’s a plus - like mittens pinned to a jacket, it won’t get lost as easily as free-floating devices. The new S version has a scheduler, so parents can manage bedtimes and switch the phone to emergency-only during school hours. The device can perform both audio and video calls and has an emergency SOS button that automatically sends video, audio, and GPS location to the contacts you’ve identified. It also offers geofencing, which alerts you if your child leaves a certain area. This is a great first cell phone for kids under 10. It can be used for basic calls and texts, and it plays music. It has a rear camera, but no selfie camera. It connects to the internet, though you can disable access by adjusting your data settings. Best of all, it’s hardy: it has a long-lasting battery and can take a licking and keep on ticking (or in this case, calling). This smartphone app, designed to be a closed ecosystem specifically for children, will give every kid that “adult phone” feeling without any of the risk. 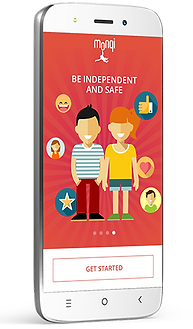 Parents download an app on their own phones, and from there they can access geotracking andgeofencing, as well as observe and manage screen time. Available only in specific countries from the Google Play and App Store. This budget-friendly smartphone features impressive entertainment features, and it has a long-lasting battery. You can install apps like Kytephone to add parental controls. Featured at a lower price than many others, this is a solid basic smartphone. HD display, front and rear cameras, expandable memory, and a very simplified layout make this a favorite first smartphone for kids. Finally, we get to the granddaddy of them all: If you feel a pressure to keep up with the Joneses and get your kid an iPhone, don’t fret - iPhones and other Apple devices come packaged with parental controls, allowing you to set certain limits on what a precocious teen can access. If you do invest in a proper smartphone with a front and rear camera, access to a data plan and enough memory for multiple apps, know that there are plenty of relatively affordable Android phones. They might lack the pizzazz of a Samsung Galaxy or the cool factor of the iPhone, but you can work up to that. Otherwise, buy a case to protect against bumps (duh) and, for Android phones that enable web-browsing, consider downloading a free antivirus tool to secure the device against malware and other cyberthreats.